where is the stagnation enthalpy, corresponding to a (possibly fictitious) state with zero velocity. The stagnation enthalpy is the same at stations 1 and 2 if , even if the flow processes are not reversible. where is the speed of sound and is the Mach number, . In deriving this result, use has only been made of the first law, the equation of state, the speed of sound, and the definition of the Mach number. Nothing has yet been specified about whether the process of stagnating the fluid is reversible or irreversible. The stagnation state is defined by , . In addition, . The static and stagnation states are shown in - coordinates in Figure 6.9. Figure 6.11 shows this relation on a - diagram. We have seen that the entropy is related to the loss, or irreversibility. The stagnation pressure plays the role of an indicator of loss if the stagnation temperature is constant. The utility is that it is the stagnation pressure (and temperature) which are directly measured, not the entropy. 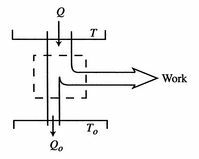 The throttling process is a representation of flow through inlets, nozzles, stationary turbomachinery blades, and the use of stagnation pressure as a measure of loss is a practice that has widespread application. The quantity on the right can be interpreted as the change in the ``Bernoulli constant'' for incompressible (low Mach number) flow. The quantity on the left is a non-dimensional entropy change parameter, with the term now representing the loss of mechanical energy associated with the change in stagnation pressure. For many applications the stagnation temperature is constant and the change in stagnation pressure is a direct measure of the entropy increase. Stagnation pressure is the quantity that is actually measured so that linking it to entropy (which is not measured) is useful. 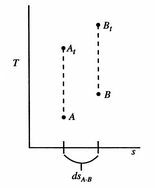 We can regard the throttling process as a ``free expansion'' at constant temperature from the initial stagnation pressure to the final stagnation pressure. We thus know that, for the process, the work we need to do to bring the gas back to the initial state is , which is the ``lost work'' per unit mass. The quantity represents a useful figure of merit for fluid machinery inefficiency due to irreversibility. During the expansion, the piston and the walls of the container will heat up because of the friction. The heat will be (eventually) transferred to the atmosphere; all frictional work ends up as heat transferred to the surrounding atmosphere. The second law states that the total entropy generated is greater than zero for an irreversible process, so that the reversible work is greater than the actual work of the irreversible cycle. The departure from a reversible process is directly reflected in the entropy change and the decrease in engine effectiveness. The final example in this section combines a number of ideas presented in this subject and in Unified in the development of a relation between entropy generation and power needed to propel a vehicle. 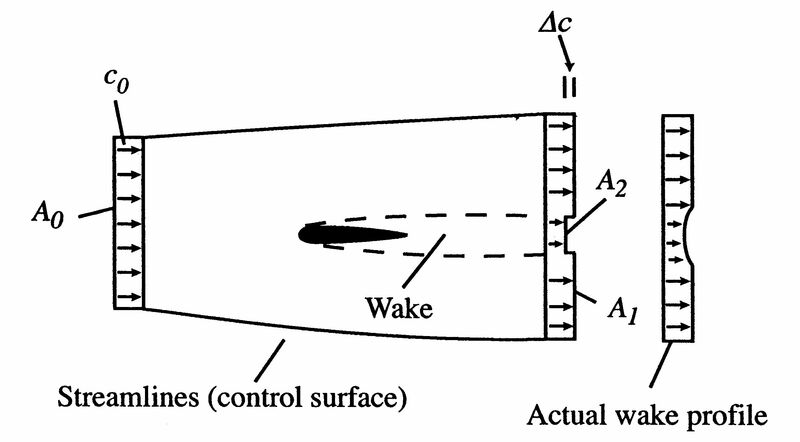 Figure 6.15 shows an aerodynamic shape (airfoil) moving through the atmosphere at a constant velocity. A coordinate system fixed to the vehicle has been adopted so that we see the airfoil as fixed and the air far away from the airfoil moving at a velocity . Streamlines of the flow have been sketched, as has the velocity distribution at station ``0'' far upstream and station ``d'' far downstream. The airfoil has a wake, which mixes with the surrounding air and grows in the downstream direction. The extent of the wake is also indicated. Because of the lower velocity in the wake the area between the stream surfaces is larger downstream than upstream. This amount of work is dissipated per unit time in connection with sustaining the vehicle motion. Equation (6.19) is another demonstration of the relation between lost work and entropy generation, in this case manifested as power that needs to be supplied because of dissipation in the wake.